Cats spontaneously develop invasive mammary carcinomas with high clinical aggressiveness, and are considered relevant animal models for human breast cancer. Bcl-2 is an anti-apoptotic pro-survival protein, whose expression is associated with a favorable outcome in human breast cancer. The aim of our study was to determine the frequency of Bcl-2 expression in feline invasive mammary carcinomas (FMCs), its relationship with other clinicopathologic variables, and its prognostic value. This retrospective study included 180 FMCs, diagnosed in female cats treated by surgery only, with a 2-year follow-up post-mastectomy. Bcl-2, ER, PR, Ki-67, HER2, and CK5/6 expression were determined by automated immunohistochemistry. A receiver-operating-characteristic curve was used to set the threshold for Bcl-2 positivity. The cohort comprises 32% (57/180) luminal FMCs defined by ER and/or PR positivity, and 68% (123/180) triple-negative FMCs (negative for ER, PR, and HER2). Bcl-2 expression was considered as positive when at least 65% of tumor cells were immunohistochemically stained. Thirty-one out of 180 FMCs (17%) were Bcl-2-positive. There was no significant association between Bcl-2 expression, and the tumor size, nodal stage, histological grade, or ER, PR, Ki-67, HER2, and CK5/6 expression. By multivariate survival analysis (Cox proportional-hazards regression), Bcl-2 positivity in FMCs was associated with longer disease-free interval (p = 0.005, HR = 0.38), overall survival (p = 0.028, HR = 0.61), and cancer-specific survival (p = 0.019, HR = 0.54) independently of other powerful prognostic factors such as pathologic tumor size, pathologic nodal stage, and distant metastasis. The positive prognostic value of Bcl-2 was confirmed in both luminal FMCs, of which 9/57 (16%) were Bcl-2-positive, and in basal-like triple-negative (ER–, PR–, HER2–, CK5/6+) FMCs, of which 14/76 (18%) were Bcl-2-positive. Compared to human breast cancer, Bcl-2 positivity in feline invasive mammary carcinomas is also associated with better outcome, but is less common, and not associated with ER, PR, and HER2 expression. 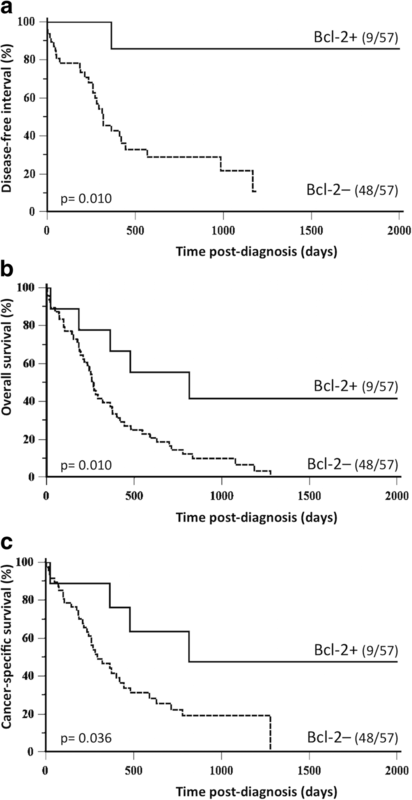 Cats with spontaneous Bcl-2-positive FMCs could be useful in preclinical trials evaluating anti-Bcl-2 strategies for chemoresistant luminal or triple-negative breast cancers. The B cell lymphoma/leukemia-2 (BCL2) gene, first discovered in B-cell malignancies , encodes the integral outer mitochondrial membrane protein Bcl-2 that is expressed by a wide range of normal tissues and tumors, and regulates the intrinsic mitochondrial pathway of apoptosis [2–4]. As an anti-apoptotic pro-survival protein, Bcl-2 overexpression in human and feline cancers would be expected to be associated with a more aggressive behavior. However in human breast cancer, it was proven in different studies that Bcl-2 expression is associated with a favorable outcome [2, 5] in terms of disease-free interval [6–10], overall survival [6, 8, 10–13] and specific survival [7, 14]. Hence Bcl-2 is reported to exert two opposing activities, one (anti-apoptotic) that promotes tumorigenesis, and another (anti-proliferative through G0 arrest), which is anti-tumorigenic . Many studies in human breast cancer have explored the protective effects of Bcl-2 positivity in luminal breast cancers, i.e., which are positive to Estrogen Receptor alpha (ER) and/or Progesterone Receptor (PR), and have found that Bcl-2 positivity is associated with a better outcome [7, 16–19]. However, few studies have explored the prognostic significance of Bcl-2 in triple-negative breast cancers, i.e., those that are negative to ER, PR, and Human Epidermal growth factor Receptor-2 (HER2). Some studies have reported that Bcl-2 positivity of triple-negative breast cancer is associated with better cancer-specific survival and disease-free survival , while other studies showed that Bcl-2 positivity is associated with a worse prognosis in terms of overall survival [13–21], and finally some authors did not find any prognostic significance of Bcl-2 in triple-negative breast cancer . Mammary tumors are common in cats and constitute approximately 17% of all feline neoplasms [22, 23]. Among feline mammary tumors, reported malignancy rates range between 80 and 90% . Feline mammary carcinomas (FMCs) have a tendency to be biologically aggressive, with a median reported overall survival time of 8–12 months post-diagnosis in most studies with follow-up [25–30]. Bcl-2 expression has been described in feline mammary carcinomas, in a study where 13 out of 15 carcinomas were Bcl-2 positive, however without associated survival analysis . To the best of our knowledge, this is the first study that investigates the prognostic significance of Bcl-2 in feline mammary carcinomas. The aims of this study were 1) to determine the frequency of Bcl-2 expression in feline invasive mammary carcinomas, 2) to correlate Bcl-2 expression with other clinicopathologic characteristics, and 3) to investigate the prognostic significance of Bcl-2 expression in triple-negative and luminal feline invasive mammary carcinomas. This retrospective study included 180 cats with invasive mammary carcinomas, diagnosed between 2007 and 2010 at two diagnostic facilities in veterinary pathology: the “Laboratoire d’Histopathologie Animale” (LHA) at Oniris, Nantes, and the “Laboratoire d’Anatomie Pathologique Vétérinaire” (LAPV) of Amboise, France. The owners’ written consent and approval from the local animal welfare committee were obtained prior to inclusion. Criteria for inclusion were (1) a diagnosis of invasive mammary carcinoma, confirmed by an absent layer of p63-positive myoepithelial cells by immunohistochemistry (monoclonal mouse anti-p63 antibody, clone 4A4, abcam ab111449) that differentiates invasive from in situ breast ductal carcinoma [32, 33], (2) in a female cat; (3) absence of other neoplasm evident at the time of diagnosis, (4) the animal was treated solely by surgery (no chemotherapy or radiation therapy pre or post mastectomy), and (5) follow-up was available for at least 48 months post-surgery. The collected clinical information included age at diagnosis, breed, spaying status, history of contraception and parity, medical history, the location of the mammary carcinoma (mammary glands M1 to M4, side, multicentricity), and evidence of distant metastases determined by medical imaging (radiography and/or ultrasonography), classified into three categories: MX (no medical imaging performed), M0 (medical imaging revealed no distant metastasis), and M1 (presence of distant metastases). All 180 cats were followed up for at least 2 years (for those animals still alive), to determine the disease-free interval (DFI, interval from mastectomy to the earliest local recurrence, new primary tumor, lymph node metastasis and/or distant metastasis), overall survival (OS, time between mastectomy and death from any cause), and cancer-specific survival (SS, time between mastectomy and death attributable to the mammary carcinoma). For disease-free interval analysis, censored cases corresponded to animals in which no locoregional recurrences and no distant metastases were reported during the follow-up period. For overall survival analysis, censored cases corresponded to animals that were alive at the end of the follow-up period, which in this study was not shorter than 730 days (2 years). For specific survival analysis, censored cases corresponded to cats that were alive at the end of the follow-up, or died from an unknown cause, or died from a cause that was not related to their mammary carcinoma. Each mammary tumor was fixed in 10% neutral buffered formalin, embedded in paraffin, and cut into 3 μm-thick sections for Hematoxylin-Eosin-Saffron (HES) staining. In case of multiple (within a given mammary gland) or multicentric (within different mammary glands) invasive mammary carcinomas, the carcinoma with the largest diameter on histological section was selected for analysis. The recorded histological types included tubular, papillary, tubulopapillary, solid, adenosquamous, anaplastic, cribriform, mucinous mammary carcinomas and comedocarcinomas, with most of the cases demonstrating more than one growth pattern. In these instances, the largest growth pattern of the tumor determined the subtype. The pathologic tumor size (pT) was measured on HES-stained histological sections as the largest tumor dimension, in millimeters. Lymphovascular invasion (LVI), the presence of lymph and/or blood vessel emboli, was assessed on the HES-stained sections. Central necrosis and squamous differentiation were assessed as present/absent regardless of extension. Tumor-associated lymphohistiocytic inflammation was quantified as absent (0), minimal (1), mild (2), moderate (3), marked (4), or severe (5), and then considered negative for scores 0–2 and positive for scores 3–5. To be considered moderate, peritumoral mononuclear inflammation had to involve at least half of the circumference of the mammary carcinoma; marked peritumoral inflammation had to be multifocally observed along all the circumference; severe peritumoral inflammation had to contain nodular lymphohistiocytic infiltrates resembling lymphoid follicles. An inguinal or axillary lymph node was removed from 126 cats (70%) during mastectomy, and the presence or absence of nodal metastases, regardless of their size, was assessed on standard HES histological sections. An anti-pancytokeratin immunohistochemistry (monoclonal mouse anti-human cytokeratins, clones AE1-AE3, Dako M3515) was performed in all cases that were initially pN0 (negative pathologic nodal stage) on HES histological sections. This led to reclassify some initially pN0 cases to pN+ (positive pathologic nodal stage) because they included isolated tumor cells (< 0.2 mm in diameter) or micro-metastases (0.2–2.0 mm in diameter). The pathological nodal stage also included a pNX category (lymph node not sampled for histopathology). FMCs were graded according to the Elston and Ellis histological grading system for human breast cancer , relying upon 3 criteria, each scored 1–3 points: the percentage of tubule formation, quantified at low-power magnification as a percentage of the tumor parenchyma; the degree of nuclear pleomorphism, assessed at high-power (400x) magnification in the least differentiated and/or most invasive portion of the tumor, typically along the periphery; and the mitotic count in 10 high-power fields (400x, field diameter 0.625 mm). Grade I (3–5 points), II (6 or 7 points), and III (8 or 9 points) carcinomas corresponded respectively to well-differentiated, moderately differentiated, or poorly differentiated carcinomas. Tumors were also graded according to the mitotic-modified Elston and Ellis (MMEE) grading system proposed by Mills et al. , in which the mitotic count categories of the EE grading system were modified to better accommodate the wide range and high magnitude of mitotic counts observed within feline mammary carcinomas. Mitotic figures were counted in 10 consecutive fields at the periphery of the tumor in the areas of highest proliferative activity. According to Mills’ publication , the thresholds for the mitotic counts were ≥ 51 and ≥ 71 mitoses in ten high-power fields. FMCs were staged according to the modified WHO staging system [36, 37] into: stage I, i.e., primary tumor less than 2 cm in diameter (pT1) with no evidence of regional or distant metastases (pN0-pNX and M0-MX); stage II, i.e., primary tumor 2 to 3 cm in diameter (pT2) with no evidence of regional or distant metastases (pN0-pNX and M0-MX); stage III, i.e., pT1-pT2 with evidence of regional metastases (pN+), or primary tumor greater than 3 cm in diameter (pT3), any pN but without evidence of distant metastases (M0-MX); and stage IV, i.e., evidence of distant metastases (M1) regardless of tumor size or nodal stage. Automated immunohistochemistry (Benchmark XT, Ventana Medical Systems, Roche Diagnostics) was used to detect Estrogen Receptor alpha (ERα), Progesterone Receptor (PR), Human Epidermal Growth Factor Receptor 2 (HER2), the proliferation marker Ki-67, Cytokeratins 5 and 6 (CK5/6), and Bcl-2 (Table 1). The detection systems were the iView DAB detection kit (Ventana Medical Systems, Roche Diagnostics, 760–091) for ERα, PR, Ki-67 and CK5/6, chosen to minimize background staining; the UltraView Universal DAB detection kit (Ventana Medical Systems, Roche Diagnostics, 760–500) for HER2, as recommended by the manufacturer; and for Bcl-2, the OptiView DAB IHC Detection Kit (Ventana Medical Systems, Roche Diagnostics, 760–700), which is a 3-step indirect, biotin-free system, chosen for its high sensitivity, and absence of background staining in feline tissues. The three detection systems use horseradish peroxidase with hydrogen peroxide substrate, and 3,3′-diaminobenzidine tetrahydrochloride (DAB) chromogen. Negative controls for IHC were included in each run, and consisted in replacing the primary antibody with normal rabbit or mouse serum (prediluted reagents, Roche Diagnostics). The positive controls were internal controls in most cases (i.e., skin epidermis and hair follicles for Ki-67; mammary gland surrounding the carcinoma for ERα, PR, CK5/6 and Bcl-2; sebaceous glands for ERα). For HER2 IHC, the pathway HER2 4-in-1 control slides (Roche Diagnostics) were chosen because they allow the quality of staining for each HER2 score (0, 1+, 2+, 3+) to be assessed. A lymph node was the external positive control used for Bcl-2, in addition to the Bcl-2+ lymphocytes present in the tumor-associated inflammation as internal positive controls. Scoring of the immunohistochemical stainings was performed by a medical doctor specialist in breast cancer pathology (DL), two certified veterinary pathologists (JA, FN), and a resident in veterinary pathology (ED), with no knowledge of either the clinical outcome or clinicopathologic data. ERα, PR and Ki-67 were scored based on the number of positive nuclei among at least 500 neoplastic cells (manual image analysis using the Image J software, Research Service Branch, National Institute of Health, Bethesda, Maryland, USA). 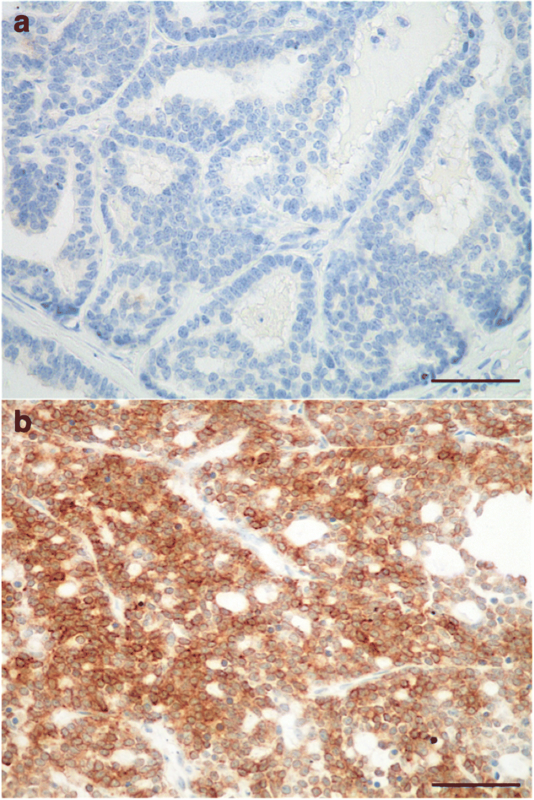 ERα and PR were considered positive if nuclear staining was observed in at least 10% of the neoplastic cells, as previously reported for canine mammary carcinomas [38–40], and human breast cancer , as the threshold proposed for ER and PR positivity of feline mammary carcinomas (Allred score equal of higher than 3)  was not significantly prognostic in this cohort. The Ki-67 index was used at a 20% threshold to discriminate between highly and poorly proliferative cases among hormone receptor-positive mammary carcinomas . Soares et al. found a Ki-67 cutoff of ≥14% in their cohort of feline mammary carcinomas, however this threshold was not prognostic in our cohort. CK5/6 was considered positive when more than 1% of the tumor cells expressed the marker in their cytoplasm, as previously reported in feline invasive mammary carcinomas . HER2 was scored as score 0 for absence of immunostaining or membrane staining of less than 10% of tumor cells, that is incomplete and is faint/barely perceptible; score 1+ for incomplete and faint/barely perceptible membrane immunostaining in more than 10% of tumor cells; score 2+ for circumferential membrane immunostaining, that is incomplete and/or weak to moderate in more than 10% of tumor cells, or complete and circumferential membrane staining that is intense but within less than 10% of tumor cells; and score 3+ for complete and intense circumferential membrane immunostaining of more than 10% of tumor cells . Carcinomas were considered HER2-positive only for a 3+ IHC score. The 180 invasive feline mammary carcinomas were classified as luminal (ERα ≥ 10% and/or PR ≥ 10%, any HER2 score) or triple-negative (ERα < 10%, PR < 10%, HER2 score 0 to 2+) according to ER, PR and HER2 expressions [42, 46, 47]. Bcl-2 expression was quantified as the percentage of positive neoplastic cells (with cytoplasmic signal) in at least 500 cancer cells (Bcl-2 index in %), and the prognostic cutoff of 65% was determined by receiver-operating-characteristic curve analysis calculated for 2-year cancer-specific survival. Statistical analyses were conducted using the MedCalc® statistical software (Ostend, Belgium). Chi-2 tests were used to compare the clinicopathologic characteristics of Bcl-2–positive and Bcl-2–negative FMCs. One-way analysis of variance was used to compare the Bcl-2 index of clinicopathologic subgroups of FMCs. The Kaplan-Meier method and log-rank tests were used in univariate survival analyses, and Cox proportional hazards models for multivariate survival analyses. The results are reported using the Hazard Ratio (HR), its 95% confidence interval (95%-CI), and the p-value of each covariate. A p-value < 0.05 was considered significant. The cohort comprises 180 female cats with invasive mammary carcinoma, whose main characteristics are listed in Table 2. The mean age at diagnosis was 11.1 ± 2.7 years (range, 4.0–19.3 years). The cats were mainly European (154/180, 85%), 13% were purebred (23/180) with most of them being Siamese (15/23) and 2% were crossbred (3/180). Twenty-six (14%) of the 180 FMCs were multiple within a given mammary gland or multicentric (affecting more than 1 mammary gland). The mean pathologic tumor size was 18 ± 7 mm (median, 18 mm; range, 4–48 mm) in the 150 cases in which it could be precisely determined; in the 30 remaining cases, tumor size was not measurable on histological sections due to infiltrated tumor margins. Fifty-six percent of the patients (101/180) had a positive pathologic nodal stage (pN+), and 8/180 (4%) had distant metastases (M1) at diagnosis. The 180 FMCs were diagnosed at stage I in 45/180 (25%) cases, stage II in 22/180 (13%), stage III in 104/180 (58%) and stage IV in 8/180 (4%) cats. Histologically, central necrosis was present in 160/180 cases (89%), squamous differentiation in 81/180 cases (45%), lymphovascular invasion (LVI) in 110/180 cases (61%), and moderate to severe tumor-associated inflammation in 103/180 cases (57%). Most FMCs expressed the estrogen receptor ERα (88%, 158/180) but only 27% (49/180) were ER-positive at a 10% threshold. The mean ERα index was 10.0 ± 13.3% (median, 5.4%; range, 0–74.2%). The mean PR index was 3.0 ± 11.0% (median, 0%; range, 0–87.8%). Most FMCs were totally devoid of PR expression (80%, 144/180), and only 7% (13/180) were PR-positive (PR index ≥10%). None of the carcinomas expressed HER2 with a 3+ immunohistochemical score. Fifty-seven FMCs (32%) were luminal (ER ≥ 10% and/or PR ≥ 10%, any HER2 score), and 123/180 (68%) were triple-negative (ER–, PR–, HER2–). The mean Ki-67 index was 45 ± 14% (median, 45%; range, 13–83%). Among the 57 luminal FMCs, 8 were luminal-A (Ki-67 index < 20%), and 49 were luminal-B (Ki-67 ≥ 20%). Positivity to CK5/6 was present in 113/180 (63%) FMCs, and did not significantly differ between luminal and triple-negative FMCs. Among the 123 triple-negative FMCs, 76 (62%) were positive to CK5/6, and defined as basal-like triple-negative FMCs. Positive immunohistochemical staining to Bcl-2 was cytoplasmic, and observed in neoplastic cells (Fig. 1) as well as some of the lymphocytes in tumor-associated lymphohistiocytic inflammation. The mean Bcl-2 index was 29.4 ± 30.4% (median, 20%; range, 0–95.0%). Most (130/180, 72%) of the FMCs expressed Bcl-2, including 55% (99/180) in at least 10% of the neoplastic cells, and 17% (31/180) in at least 65% of the cancer cells, which was the threshold for positivity with prognostic significance. Using this cutoff, 16% (9/57) of the luminal FMCs, and 18% (22/123) of the 123 triple-negative FMCs were positive to Bcl-2. Bcl-2 positivity was not significantly more common in luminal-A FMCs (2/8 cases) than in luminal-B FMCs (7/49 cases). Among the 76 basal-like triple-negative FMCs, 18% (14/76) were Bcl-2–positive. In the global cohort (180 FMCs), Bcl-2 positivity was negatively associated with distant metastasis (p = 0.015), squamous differentiation (p = 0.002), and the magnitude of tumor-associated inflammation (p = 0.038). There was no significant association between Bcl-2 positivity and the pathologic tumor size, pathologic nodal stage, histological grade, Ki-67 proliferation index, ER, PR, HER2 expression, and the immunophenotype. In the 57 luminal FMCs, as well as in the 123 triple-negative FMCs, there was no significant association between Bcl-2 positivity and the pathologic tumor size, pathologic nodal stage, histological grade, and Ki-67 index. In the 76 triple-negative basal-like FMCs, Bcl-2 positivity was significantly negatively correlated with the severity of peritumoral lymphohistiocytic inflammation (p = 0.005). By univariate survival analysis, Bcl-2 positivity was associated with a favorable outcome in the global cohort, in terms of disease-free interval (HR = 0.44, 95% CI: 0.27–0.71; p = 0.007; Fig.2a), overall survival (HR = 0.61, 95%-CI: 0.43–0.88; p = 0.019; Fig. 2b), and cancer-specific survival (HR = 0.59, 95% CI: 0.39–0.90; p = 0.030; Fig. 2c). In the first 2 years post-diagnosis, 64% of cats had experienced locoregional recurrence and/or distant metastasis in the Bcl-2–negative group, compared to 37% in the Bcl-2–positive group. The median overall survival was 449 days (14.7 months) for female cats with a Bcl-2–positive FMC, but only 259 days (8.5 months) for female cats with a Bcl-2–negative FMC. At 2 years post-diagnosis, 73% of cats with a Bcl-2–negative FMC had died from cancer, compared to 51% of cats with a Bcl-2–positive FMC. By multivariate survival analysis using Cox proportional hazards regression, Bcl-2 positivity was associated with a longer disease-free interval (HR = 0.57, 95%-CI: 0.34–0.96; p = 0.034) independently of the pathologic tumor size (pT ≥ 20 mm: HR = 1.52, 95%-CI: 1.04–2.21; p = 0.029), and positive nodal stage (pN+ compared to pN0: HR = 2.36, 95%-CI: 1.27–4.41; p = 0.007; Table 3). The favorable prognostic value of Bcl-2 positivity was also significant in overall survival (HR = 0.58, 95%-CI: 0.37–0.90; p = 0.015) with the pathologic tumor size, pathologic nodal stage, distant metastasis, and tumor-associated inflammation as the covariates of the model (Table 3). The probability of cancer-related death in this cohort of female cats with invasive mammary carcinoma could be predicted with Bcl-2 expression and the 3 parameters of cancer stage (tumor size, nodal stage, and distant metastasis; Table 3). In this model, Bcl-2 positivity of feline invasive mammary carcinomas was associated with a 2-fold decrease in the risk of cancer-related death (HR = 0.50, 95%-CI: 0.30–0.84; p = 0.008). By univariate survival analysis, Bcl-2 positivity was associated with a good outcome in cats with luminal FMC, in terms of disease-free interval (HR = 0.20, 95% CI: 0.09–0.46; p = 0.010; Fig. 3a), overall survival (HR = 0.36, 95%-CI: 0.20–0.67; p = 0.010; Fig. 3b), and cancer-specific survival (HR = 0.40, 95% CI: 0.20–0.82; p = 0.036; Fig. 3c). By multivariate survival analysis, Bcl-2 positivity was associated with a longer disease-free interval (HR = 0.09, 95%-CI: 0.01–0.64; p = 0.017), a longer overall survival (HR = 0.28, 95%-CI: 0.11–0.72; p = 0.008), and a lower risk of cancer-related death (HR = 0.31, 95%-CI: 0.11–0.89; p = 0.031), as depicted in Table 4, with in each model, the pathologic tumor size and tumor-associated inflammation as the covariates. These results indicate that Bcl-2 expression, tumor size, and cancer-associated lymphohistiocytic inflammation were the 3 significant and independent predictors of the outcome of female cats with ER+ and/or PR+ mammary carcinoma in this cohort. There was no significant association between Bcl-2 expression and the outcome of the 123 female cats with triple-negative FMC. However, there was a non-significant trend for Bcl-2 positivity to be associated with favorable disease-free interval (p = 0.06), overall survival (p = 0.07), and specific survival (p = 0.09) in the subcohort of 76 triple-negative basal-like FMCs. By multivariate survival analysis, Bcl-2 positivity of triple-negative basal-like FMCs was associated with a longer overall survival (HR = 0.53, 95%-CI: 0.28–0.99; p = 0.047) independently of the WHO feline staging system (Table 5), and a lower risk of cancer-related death (HR = 0.45, 95%-CI: 0.21–0.99; p = 0.047) independently of the pathologic nodal stage (Table 5). The objective of our study was to investigate Bcl-2 expression in a large cohort of feline mammary carcinomas, and to assess its relationship with other clinical and pathological features. We also aimed at investigating the prognostic significance of Bcl-2 expression in FMCs in order to evaluate its significance in the feline patient, and to compare with previous studies in human breast cancer. The results showed that Bcl-2 was a powerful prognostic factor that was independent of cancer stage. When compared to the Bcl-2 negative group of FMCs, the Bcl-2 positive group showed a more favorable outcome in terms of disease-free interval, overall survival and specific survival, both in luminal and basal-like triple-negative FMCs. In our study, Bcl-2 was frequently expressed in feline mammary carcinomas, as 72% of the cases expressed some kind of staining in the cytoplasm of tumor cells. Using the most significant threshold for positivity of 65%, 17% of FMCs (31/180) were positive for Bcl-2. Our results are relatively close to those reported in human breast cancer studies in terms of frequency of Bcl-2 expression: at 10% threshold for positivity, Bcl-2 is expressed in 68.2% of the 7230 human invasive mammary carcinomas according to the large-scale study by Hwang et al. in comparison to 52.2% in our study. But the frequency of Bcl-2 expression varies enormously depending on the authors: from 35% of the 346 metastatic breast cancers studied by Chang et al. to 74.9% of the 250 cases described by Hellemans et al. .
Bcl-2 expression in FMCs was previously reported in another study in the literature. According to Madewell et al. , Bcl-2 was also frequently expressed in FMCs, it concerned 13 out of the 15 invasive mammary carcinomas, (i.e., 86.7% of the studied carcinomas) with Bcl-2-positive carcinomas containing 20–80% of immunolabeled cells. In our study and especially in the global cohort, Bcl-2 positivity was inversely associated with aggressive features, such as distant metastasis at diagnosis. These results are in agreement with the studies published on human breast cancer, where Bcl-2 positivity has been associated with favorable clinicopathologic features, such as smaller tumor size [9, 12, 50–56], and negative nodal status [12, 18, 51, 52], in both triple-negative and non-triple-negative breast cancer , although in the present study, Bcl-2 positivity of FMCs was not significantly correlated with the pathologic tumor size and nodal stage. There are other differences between feline and human invasive mammary carcinomas with respect to Bcl-2 expression, as there was no significant association between Bcl-2 and the histological grade, ER, PR, Ki-67, or the luminal phenotype in the present study. Conversely, in human breast cancer, Bcl-2 positivity is associated with a lower histological grade according to numerous publications [7, 9, 18, 51, 52, 58–63], including in locally advanced breast cancers [51, 53]. A consistent and strong positive correlation between Bcl-2 positivity and hormone receptor expression is reported in breast cancer, and concerns both ER and PR [7, 9, 12, 19, 49, 51, 52, 54, 55, 58–60]. Bcl-2 positivity of breast cancers has been associated with a lower Ki-67 proliferation index [7, 12, 16, 50, 60], with the luminal phenotype , and especially the luminal-A phenotype . Indeed, BCL2 is upregulated by estrogens in breast cancer cells , explaining why Bcl2-positive expression in breast cancer may be considered a sign of ER functional activity . By comparison, luminal FMCs were relatively rare in this cohort (57/180, 32% of the cases) compared to triple-negative FMCs, and Bcl-2 positivity was not associated with the luminal or triple-negative phenotype. This suggests an overrepresentation in the feline species of invasive mammary carcinomas in which the ER pathway is poorly functional, and in which Bcl-2 expression does not proceed from estrogen exposure, but rather from other mechanisms still to be determined. Our results show that Bcl-2 positivity in FMCs is associated with a better outcome by univariate and multivariate analysis in terms of disease-free interval, overall survival and cancer-specific survival in the global cohort. In human breast cancer, Bcl-2 positivity is also associated with a decreased risk of cancer progression and death. For example, Hwang et al. showed in a series of 7230 primary breast cancer patients, that Bcl-2 positivity was associated with better overall survival (HR, 0.42; 95%-CI, 0.42–0.71; p < 0.001), independently of patient age at diagnosis, the histologic grade, tumor size and nodal stage, hormone receptor and HER2 expression, and lymphovascular invasion. Dawson et al. showed that positivity to Bcl-2 was associated with a longer survival independently of tumor size, histologic grade, hormone receptor status, and HER2 overexpression. Bcl-2 positivity has also been associated with longer disease-free survival [5–10, 60], longer overall survival [5, 6, 8, 10, 11, 13, 49, 66–68], and lower risk of cancer-related death [14, 52, 69] in other reports, especially in luminal breast cancers [7, 12, 18]. In the 57 luminal FMCs, Bcl-2 positivity was also associated with better outcome in terms of disease-free interval, overall survival and specific survival, independently of the pathologic tumor size and tumor-associated inflammation. Many studies in human breast cancer have reported the protective effect of Bcl-2 positivity in the luminal phenotype. Kim et al. showed by univariate analysis in their study of 159 patients with luminal (ER+ and/or PR+) breast carcinoma, that Bcl-2 positivity (at 33% cutoff for positivity) was one of the 4 prognostic factors associated with progression-free survival, the others being patient age at diagnosis (at a threshold of 35-years), tumor size (at a threshold of 2-cm), and nodal stage (positive / negative). By multivariate analysis, only Bcl-2 and the nodal stage retained their independent prognostic value . We also investigated the prognostic significance of Bcl-2 in the triple-negative basal-like (ER, PR, and HER2 negative, and CK5/6 positive) subtype of FMCs. Among the 76 basal-like triple-negative FMCs, 18% (14/76) were Bcl-2–positive, and were associated with a better outcome in terms of overall survival, and specific survival, independently of the pathologic nodal stage or the WHO cancer stage. These results indicate that there exists a subgroup of triple-negative basal-like FMCs, identified in this cohort by CK5/6 positivity, in which Bcl-2 expression exerts a favorable prognostic influence. In human breast cancer, the prognostic significance of Bcl-2 positivity in triple-negative carcinomas is controversial. Abdel-Fatah et al. reported that Bcl-2 negativity in triple-negative breast cancer was associated with a 2-fold increased risk of death (HR = 1.71; 95%-CI 1.21–2.41; p = 0.002) and recurrence (HR = 1.79; 95%-CI 1.34–2.38; p = 0.0005); in multivariate survival analysis, Bcl-2 negativity was also associated with worse cancer-specific survival and progression-free survival independently of the nodal stage. Other studies however showed that Bcl-2 positivity is associated with a worse prognosis in triple-negative breast cancer [21, 58, 70], and finally some authors did not find any prognostic significance of Bcl-2 in triple-negative breast cancer . These discrepant findings might result from the heterogeneity of triple-negative breast cancers (TNBCs), which comprise at least “luminal-Androgen Receptor” and “basal-like” subtypes according to gene expression studies . Bcl-2 may have different roles in different TNBC subtypes, as it was shown for instance that Bcl-2 positivity is more common in non basal-like than in basal-like TNBCs , and BCL2 gene expression is highest in the “mesenchymal stem-like” molecular subtype of TNBC defined by Lehmann et al. . The biological mechanisms underlying the prognostic role of Bcl-2 in human breast cancer remain mysterious and largely uncertain. Bcl-2 is well known as an anti-apoptotic oncogene in lymphomas , and this anti-apoptotic function may explain why Bcl-2 positivity has been associated with the chemoresistance [63, 74, 75] and radioresistance  of breast cancer cells. However, the paradoxical antiproliferative function of this tumor suppressor gene has been described in multiple human cancer cell lines and murine mammary carcinoma models [15, 77]. Bcl-2 may thus be tumor-suppressive and at the same time oncogenic in specific cell types or under specific circumstances. Of importance, the Bcl-2 protein does not act alone in regulating mitochondrial outer membrane permeabilization, but rather in interaction with other Bcl-2 family members, which are not only involved in regulating the intrinsic pathway of apoptosis, but also calcium homeostasis, autophagy, and possibly DNA repair in cancer cells . Thus concomitant evaluations of the expression of several Bcl-2 family members may be required to understand their potential effects in feline mammary carcinoma development and prognosis. This is the first study that investigates the prognostic significance of Bcl-2 in feline mammary carcinomas. 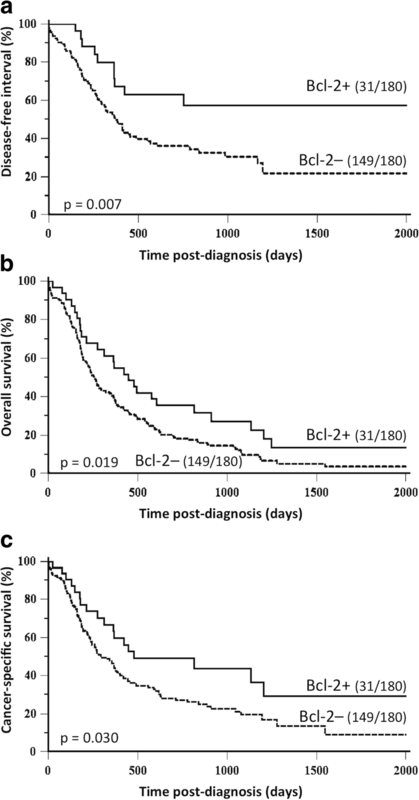 We showed, as described in human breast cancer, that Bcl-2 positivity was associated with a favorable clinical outcome in terms of disease-free interval, overall survival, and specific survival in feline invasive mammary carcinomas, which suggests that Bcl-2 may have similar roles in human and feline mammary carcinomas. The cat appears to be a relevant naturally-occurring model for Bcl-2 overexpression in both luminal and triple-negative basal-like carcinomas, opening the way for possible translational perspectives, especially for evaluating in cats new therapeutic agents targeting Bcl-2 for chemoresistant luminal or triple-negative breast cancers. The authors thank Dr. Mélanie Pohu, Dr. Floriane Morio, and Dr. Clotilde de Brito, who helped in collecting the clinical and follow-up data, as well as the veterinary pathologists (Dr. Jean-Loïc Le Net, Dr. Virginie Théau, Dr. Pierre Lagourette, Dr. Olivier Albaric and Dr. Sophie Labrut) who performed the initial diagnoses of feline mammary carcinomas, and the technicians in histopathology (Mr. Bernard Fernandez, Mrs. Florence Lezin, and Mrs. Catherine Guéreaud) who made the slides. Finally, we thank the referring veterinarians and the owners of the cats included in this study, who gave us the clinical and follow-up data. This work was supported by the French National Cancer Institute (INCa, Institut National du Cancer) with a grant for translational research (INCa-DHOS 2010, Pr M. Campone); by a grant for PhD students from the Ministry of Education and Higher Education of Lebanon (Dr Elie Dagher); and by Roche Diagnostics GmbH, Germany, which provided financial and technical support for the immunohistochemical characterization of the carcinomas. The funders had no role in study design, data collection, analysis and interpretation, decision to publish, or preparation of the manuscript. FN, JA and MC conceived and designed the experiments. DL, DF and MC ensured that the data collected in cats were analyzed in a comparative oncology approach. ED, JA, DL and FN carried out the histological and immunohistochemical analysis of the mammary carcinomas. ED and FN drafted the manuscript. All authors read and approved the final manuscript. JA and FN (DVM) are DipECVP, European Veterinary Specialists in Veterinary Pathology. DL (MD) is a pathologist, MC (MD) is a medical oncologist, both specialized in breast cancer and glioblastomas. The owners’ written consent and approval from the local (Oniris) animal welfare committee were obtained prior to inclusion.